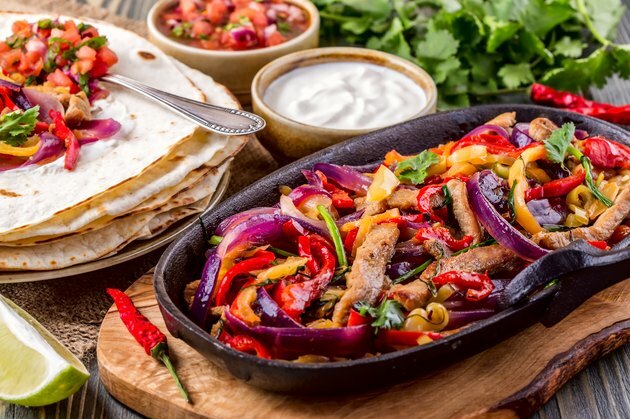 Traditional fajita meat is marinated skirt steak, but fajitas can contain anything from chicken and shrimp to venison or even tofu. Cooking fajita meat in a skillet is simple, since the thin strips cook through very quickly. Before you cook fajita meat, let it marinate overnight to make it more tender and flavorful. Always cook fajita meat first, adding the vegetables at the end of the cooking time so that they stay crisp and retain their nutrients. Pour enough olive oil into the bottom of a frying pan to coat it. Any oil will work, but olive oil is high in heart-healthy omega-3 fatty acids and also adds flavor. Heat the frying pan over medium-high heat until you can just begin to smell the olive oil, and a little water flung into the pan sizzles. Add the fajita meat all at once. Let it sit for a few seconds, and then push and turn it with a wooden spoon or pancake turner. Let the fajita meat cook for seven to 10 minutes, stirring and turning the meat constantly. Take random samples with an instant-read thermometer to check for doneness. Beef is done at 145 degrees Fahrenheit, pork at 160 degrees Fahrenheit and chicken at 165 degrees Fahrenheit. Fish is done when it is opaque all the way through and flakes easily. Use leftover fajita meat to add protein to a Southwestern or Mexican flavored salad. Never let anything used to handle or store raw meat come into contact with cooked meat.